How Many Chickens Do I Need In A Successful Flock? You are standing in the feed store starting at all the adorable fluffy chicks, wondering how many you should bring home. There’s room for a couple extra in your coop, right? Right??!? Or maybe you already have a flock. But this year they aren’t laying as much as they used to, and you’re thinking about buying a few pullets. Or you are hoping to breed your own stock. And you find yourself wondering, how many chickens do I need, anyway? Deciding how many chickens you need can vary depending based on a lot of factors. And the answer may change for you depending on your goals or management styles. The first consideration is your location. A hard upper limit based on your zoning laws may make the decision for you. In my city you can have three hens without a permit, and more birds with a permit. Want the best of Farming My Backyard’s chicken wisdom compiled in one easy to access source? 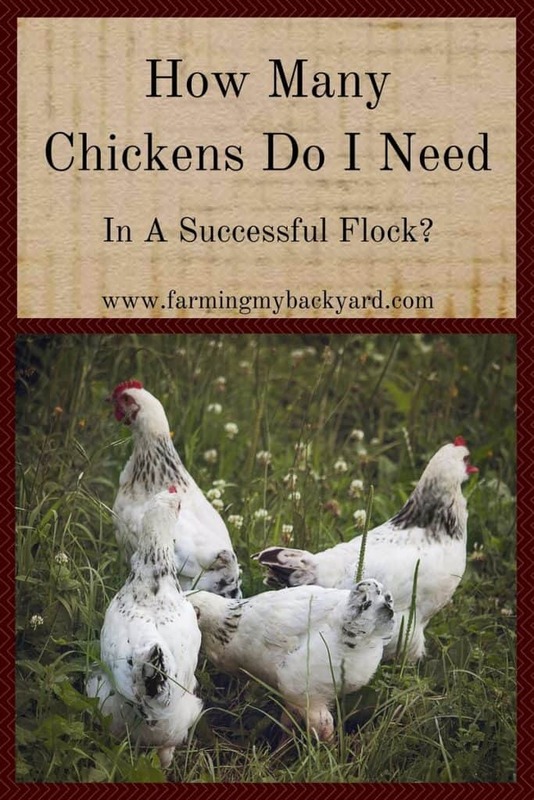 Check out our book, Backyard Chickens: How To Have A Happy Flock! The second major consideration is how much space you have for your chickens. At absolute minimum, the birds will need 3 square feet of indoor space (including 1 foot of roosting space), and 10 square feet of outdoor space. But more is better! If you want to free range your birds, you will need at least 200 square feet of pasture per bird or they will eat it right down to the dirt. And if you have more and can rotate that’s even better too. Even if you have a ton of space you still may not want a huge flock depending on your goals, available time, or diet. Someone who uses a few eggs a week for baking will want fewer birds than someone who is eating a paleo or low carb diet. 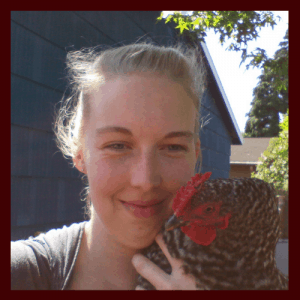 A homesteader who works full time doesn’t necessarily want to spend their weekend mucking out a large chicken coop. For them a better choice is small one that can be quickly refreshed in the evening after work. And the flock size required to breed your own replacement stock is going to be substantially smaller than if you are making a side business selling hatching eggs, chicks, or started pullets. How many chickens do I need for eggs? Different breeds of chickens lay different amounts of eggs over the course of a year. When deciding which chickens to buy, this is something you will want to check for each breed you are considering. As a basic rule of thumb you can plan on having three chickens per two members of your household. So how many chickens do you need for a family of four? Probably around six young laying hens. A family of six? Better plan on about nine chickens. Starting an egg business? Go with as many birds as you can adequately house! Older birds lay fewer eggs, which you need to plan around in advance. Some people buy new stock every year or two and send the old birds to freezer camp (aka the soup pot). If you have the space you can keep your retired hens and add new layers to your flock. I like to bring in two or three new birds every year or two depending on how many “spaces” I have available in our 12 bird coop. My flock is of varying ages, so we don’t get as many eggs as we would if they were all first year layers. The kids get attached to the birds, so it works for this time in our life. How many chickens do I need to keep for breeding? If you are raising your own breeding stock, you will need to include roosters in your flock. One rooster can serve anywhere from two to ten hens. If you use the spiral mating system you can get started in the first year with as few as three hens and three roosters, but obviously you numbers will fluctuate during different times of the year. Keep one to two percent of your best offspring and cull the rest. Also, it’s a good idea to have at least a “spare” rooster and a few hens for each family in case of losses. If you use a three family system you may need to bring in new genetics after about twenty years, but if you use more, like say a five group system you can go even longer without bringing in new blood. How many chickens should I start with? If this is your first time getting chickens I recommend you start with a small flock. Chickens are social animals, and need to have at least one or two other chickens around. It’s easy to put together a cheap and basic chicken coop for three hens. Once you’ve had them for a while you may find that there are certain design features of your coop that you hate. Or you find you’d actually rather have the chickens on the other side of your lot. Or you realize maybe chickens aren’t right for you after all. It’s much easier to make changes for a small flock and then size up than it is to start with to many birds and realize you’ve gotten in over your head. By adding a few chickens at a time you can find the ideal flock size is for your personal circumstances. I’ve varied from three to thirty birds, and I’ve found my personal favorite flock size is about five or six. How many chickens do you keep in your flock? Share below in the comments! We are getting our first flock tomorrow! We are getting 2 silkies, and 4 buff orpingtons. I am hoping one of the buffs is a rooster. So we are starting small with 6. We are really excited. FUN!!!!! I’m so excited for you! Hi, my name is Mike! I have to say I agree most of your article! We had a friend who had layer chickens, (Comets we think) who always talked to me about his chickens. So, I got interested, and then one day out of the blue I asked him if we could buy some of his chickens. His flock was quite old and on the way to freezer camp, so he sold us five old layers which in the end he did not charge us for. I can only say after receiving the five worn out hens and setting things up for them,if you are having, or getting thoughts about getting old chickens, you don’t need to worry ABOUT IT! They will teach you a new way of life, and you will be happy and laughing for the rest of your life!